Shelby Bryce has been a school counselor for eight years, spending all eight years at Lone Tree Community Schools serving grades PreK through 12. 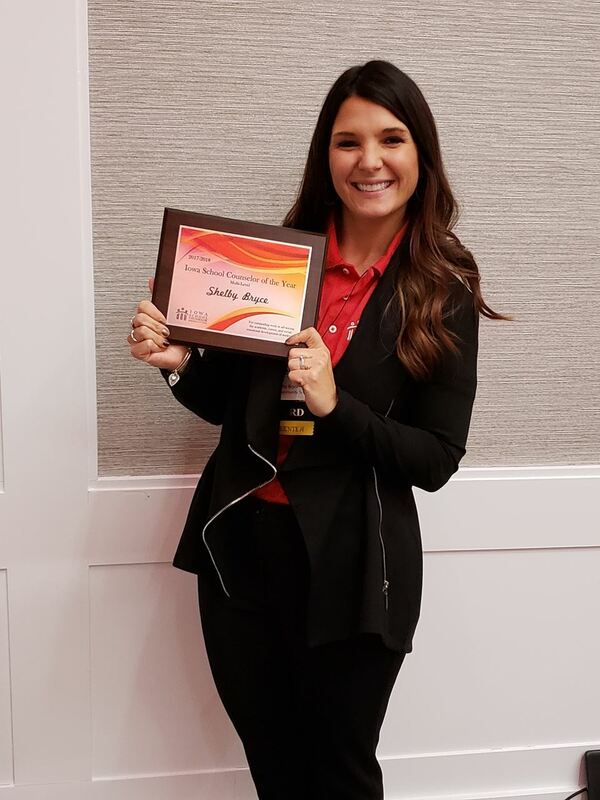 Shelby is a tremendous leader and advocate for school counselors, serving as the K-12 VP for ISCA, participating on both the ICAN and University of Iowa Admissions advisory boards, and helping pilot programs for ICAN and the Workplace Learning Connection. This passion for service not doubt played a role in establishing a program to increase volunteerism among her high school students. At Lone Tree, Shelby has established a comprehensive PreK-12 program by using advocacy, leadership, systemic change, and collaboration. In addition to increasing the number of hours high school students spent in the community volunteering, Shelby focused attention on junior high students establishing SMART goals in the areas of career, academic, and social/emotional development. At the elementary level, she created a transition program for students entering their next grade that includes a “letter from your future teacher”. Shelby was also instrumental in implementing the OLWEUS anti-bullying program and Lone Tree and establishing culture-building days and activities such as the Lone Tree Community Service Day and Lone Tree Self-Care/Stress Management Day. Additionally, Shelby helped spearhead the SUPPORT (Student Understanding, Pioneering, and Providing Out-Reach Together) mentoring program that pairs at-risk middle school students with exceptional 10th and 11th grade students.